Mastercard has been working on a new technology that is poised to take in-store shopping to a new, multisensory, digital-driven level, in the form of smart mirrors that can identify products, change lighting, play music and take payments. Rolling out in UK stores this year, the interactive touch-screen mirrors are already being used by a number of US retailers including Levi’s. The mirrors, powered by Masterpass, allow customers to personalise their changing room experience by choosing their preferred lighting, language and music. RFID technology embedded in the hang tags of clothing recognises products as they enter the room, creating a virtual basket and recommending matching items from the store’s inventory, while customers can view or request size and colour variations and connect with sales associates. 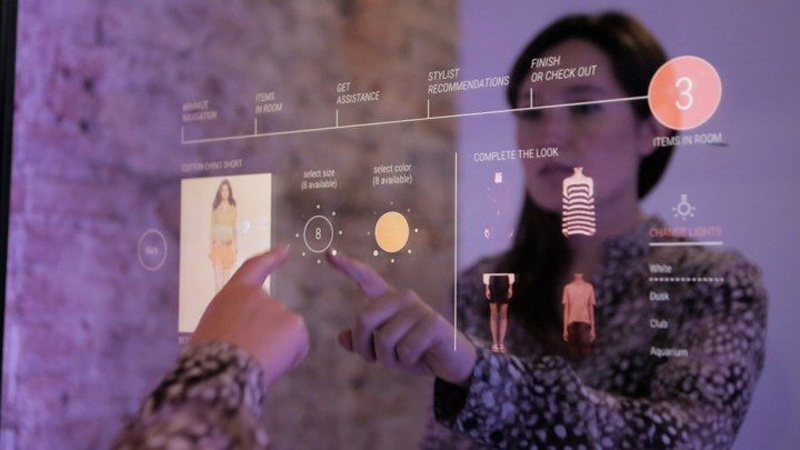 The technology also saves length of time spent in the fitting room by 40% and cuts checkout queues as it allows payment, with customers only required to tap the mirror with a card or payment device to complete the purchase. Mike Cowen, head of digital payments at Mastercard UK said, “Augmented and virtual reality is transforming how we shop. And while high streets are being challenged by the popularity of online shopping, these technologies allow retailers to fight back by giving the public the digital convenience they demand. The smart mirror, along with other advanced payment systems developed with Mastercard was on show at this year’s Money 20/20 conference.